Backstamp: black printed Adams Member of the Wedgwood Group. Stemmed egg cup. Backstamp: Adams Micratex England. A little blue smudging and a touch of wear underneath, otherwise excellent condition. Backstamp: Adams England. There is a little wear to the rim of the small cup and the occasional blue smudge, overall good condition. Stemmed egg cup. Backstamp: Chinese Bird Adams England. A few lines of crazing and just a little minor wear to the rim otherwise excellent condition. A goose or double egg cup with two different pattern cartouches each side of the large cup. This lovely piece has seen a little life! It has light crazing with two small chips tot he rim of the smaller cup and a small nick and some wear to the rim of the larger cup. No makers marks. Blue printed backstamp. Excellent condition. Light all over crazing and the foot has been ground down a little underneath otherwise fine. Blue printed backstamp Allertons Made in England. Blue printed backstamp Allertons Made in England. Light crazing, otherwise lovely. Lovely double cup with main Willow pattern to the large cup and the border pattern only to the small. Backstamp: Allertons Est 1831 England Willow Made in England. Excellent condition. With gilt. Backstamp: Willow Arklow D. The gilt is a little worn and there are a few signs of age, overall though good. Lovely cup printed in a rich dark blue. Probably once with gilt as there are just traces to the rim. Backstamp: Birks Rawlins & Co Stoke on Trent Made in England. Minor wear to the rim otherwise excellent condition. With gilt. Backstamp: Dragon above blue printed caduceus and Bishop England below A little minor wear to the gilt otherwise excellent condition. Bone China with gilt. A gorgeous cup with fluted body. Backstamp: Brown printed Blair's China England. Very pretty little egg cup printed in a steely blue. Rural scene around the outside of the cup with the grapevine and wheat border pattern around the inside. Backstamp: British Scenery Booths Silicon China Made in England. Minor wear to the rim otherwise excellent condition. With gilt. Backstamp: Booths Made in England. A little very minor blue smudging here and there otherwise excellent condition. Blue printed barrel shape with gilt decoration. Some wear to gilt. Green and white, with gilt. With gilt. Backstamp: Booths Silicon China Made in England Real Old Willow. WITHOUT GILT. Brown diamond pattern around the inside rim. Backstamp: Booths Made in England. A little blue smudging here and there otherwise excellent condition. With gilt. Backstamp: Booths Silicon China, Made in England, Real Old Willow. Light all over crazing, the gilt is very worn and underneath a little wear. With gilt. Brown diamond pattern around inside rim, gilt around the top rim, no gilt around foot rim. No backstamp. Excellent condition. A8025 with gilt. Brown diamond pattern inside the rim of the cup. Backstamp: Booths Made in England. With gilt. Backstamp: Booths Silicon China Made in England Real Old Willow. Date of manufacture probably 1935-36. Crazed with a little discolouration inside. Provenance: The Entwistle Collection. With Gilt. Backstamp: Booths Silicon China England Real Old Willow (the latter partly depleted). Date of manufacture probably 1916-17. Crazed with a little associated discolouration. Provenance: The Entwistle Collection. With gilt. Gilt diamond border pattern around the inside rim. No backstamp. Light crazing otherwise excellent condition. With gilt. Inside the cup is the blue border decoration with the brown and gilt diamond pattern. Backstamp Booths Silicon China Made in England. The gilt is quite worn otherwise excellent condition. Provenance: The Entwistle Collection. With gilt. No backstamp. Date of manufacture probably 1915-16. Quite a large cup with a little wear to the gilt otherwise excellent condition. Provenance: The Entwistle Collection. No gilt version of this pattern. No backstamp. A little minor wear to the rim otherwise excellent condition. With gilt. Octagonal stand with four indents for the egg cups to stand in. Backstamp Booths Silicon China Made in england Real Old Willow and impressed Booths and date for 1931. Provenance: The Entwistle Collection. With gilt. No backstamp. Date of manufacture probably 1915-16. Light all over crazing and the gilt is very worn otherwise fine, a lovely piece. Provenance: The Entwistle Collection. With gilt. A fabulous set of four barrel egg cups on an octagonal stand. Backstamp: Booths Silicon China Made in England Real Old Willow also on stand impressed Booths and date for 1930 and in script 9072. There is a small minor rub under the rim of the stand, three of the cups have light crazing and on the fourth the gilt is very worn and it is a slightly different shade of blue so possibly a marriage. Overall though in excellent condition. With gilt. Backstamp: Booths Silicon China Made in England Real Old Willow and on Stand impressed Booths and date for September 1931 and in script 9072. A fabulous set of four barrel egg cups on an octagonal stand all in superb condition. Provenance: The Entwistle Collection. Lovely little egg cup with ochre rim and the floral part of this pattern either side of the body. Backstamp: Booths Silicon China Made in England. A tiny tiny nick to the rim, a little minor wear to the foot rim and light all over crazing. Stemmed egg cup with ochre rim. Backstamp: Booths Silicon China England. Light all over crazing and inside to the base a little grit in the glaze. Originally introduced about 1913 as Chinese Peacock, but later renamed Blue Bird. Barrel egg cup with solid blue rim. Backstamp: Burleigh Ware B & L Burslem England. Small blemish inside and a little wear underneath. Burleigh Ware. Originally introduced about 1913 as Chinese Peacock, but later known as Blue Bird. Backstamp: Burleigh Ware B L Burslem England. Excellent condition. This is an absolutely fabulous set of four stemmed egg cups in an ornate stand. Backstamp on stand: B & L Burleigh Ware Burslem England. Crazed with some discolouration underneath the stand and to a couple of the cups. Another cup has some amateur restoration to the foot (not noticeable when the cup is in situ'). Overall a rare and unusual set. With gilt. Backstamp: Burleigh Ware Willow England. A touch of wear to the gilt and a little blue smudging, overall excellent condition. Burleigh stemmed egg cup with gilt. The gilt shows some signs of wear otherwise is in excellent condition. With gilt. Lovely piece, square with wavy rim and four indents for egg cups to sit it. Backstamp: BurleighWare Willow England. A little minor wear to the gilt otherwise excellent condition. Made in England. Brand new and first quality, dishwasher and microwave safe. Blue Arden. This item has been discontinued by Burleigh and is no longer available. Made in England. Brand new and first quality, dishwasher and microwave safe. Blue Asiatic Pheasants. This item has been discontinued by Burleigh and is no longer available. Made in England. Brand new and first quality, dishwasher and microwave safe. Blue Asiatic Pheasants. This item has been discontinued by Burleigh and and is no longer available. Made in England. Brand new and first quality, dishwasher and microwave safe. Blue Bird. This item has been discontinued by Burleigh and is no longer available. Made in England. Brand new and first quality, dishwasher and microwave safe. Blue Burgess Chintz. This item has been discontinued by Burleigh and is no longer available. Made in England. Brand new and first quality, dishwasher and microwave safe. Dark Blue Calico. 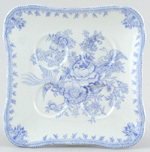 Delightful wavy rim tray with four indents for egg cups to sit in. This item has been discontinued by Burleigh and is no longer available. Made in England. Brand new and first quality, dishwasher and microwave safe. Dark Blue Calico. Delightful wavy rim tray with four indents for the egg cups to sit in. This item has been discontinued by Burleigh and is no longer available. Four barrel egg cups on a tray with indents for them to sit in. Backstamp: Calico Burleigh Staffordshire England. Two of the cups have light crazing otherwise excellent condition. Made in England. Brand new and first quality, dishwasher and microwave safe. Pale Blue Calico. This item has been discontinued by Burleigh and is no longer available. Made in England. Brand new and first quality, dishwasher and microwave safe. Dark Blue Chequers. This item has been discontinued by Burleigh and is no longer available. Made in England. Brand new and first quality, dishwasher and microwave safe. Red Chequers. This item has been discontinued by Burleigh and is no longer available. Made in England. Brand new and first quality, dishwasher and microwave safe. Davenport is traditional off white tableware with embossed strawberry and grape design and has the backstamp: “As originally produced by Davenport 1794-1887 Burleigh Staffordshire England”. This item has been discontinued and is no longer available. Made in England. Brand new and first quality, dishwasher and microwave safe. Pale Blue Felicity. This item has been discontinued by Burleigh and is no longer available. Made in England. Brand new and first quality, dishwasher and microwave safe. This item has been discontinued by Burleigh and is no longer available.